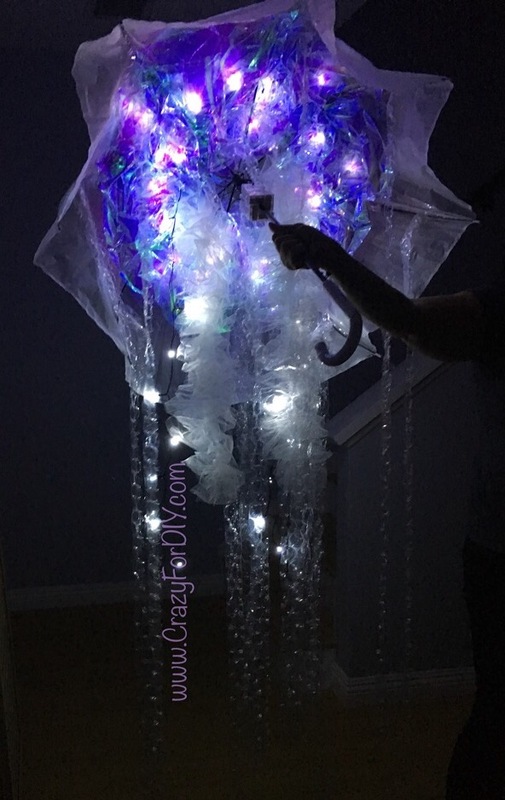 DIY Jellyfish Costume – Crazy for D.I.Y. 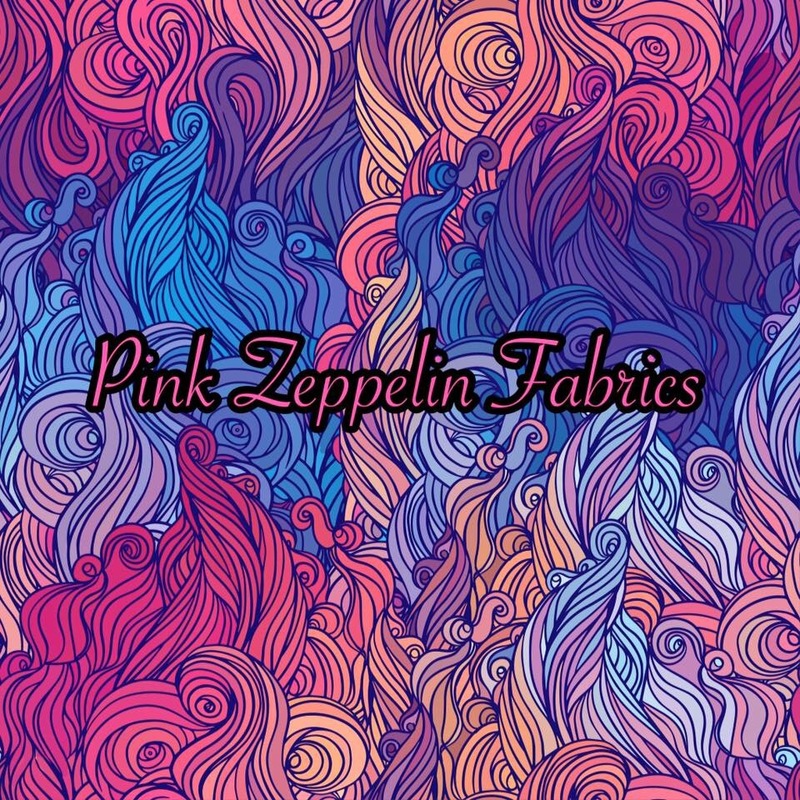 October 24, 2016 November 24, 2018 • Crazy for D.I.Y. 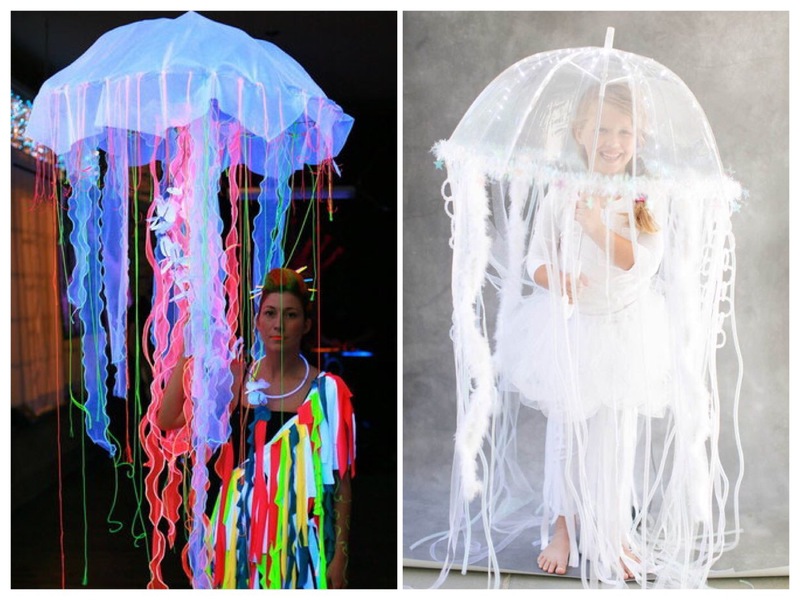 I wanted to create a super easy DIY jellyfish costume to go with their theme. 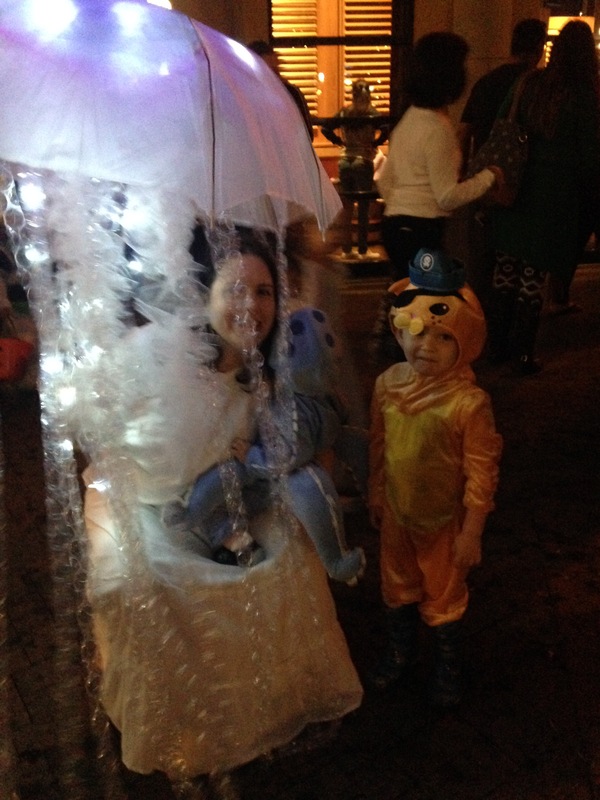 Umbrella, tulle, lights and bubble wrap. The umbrella was from the Daiso Japan store for $3. I bought 4 battery powered led lights from the dollar store. $4 iridescent celephane roll. $3 jumbo bubble wrap. 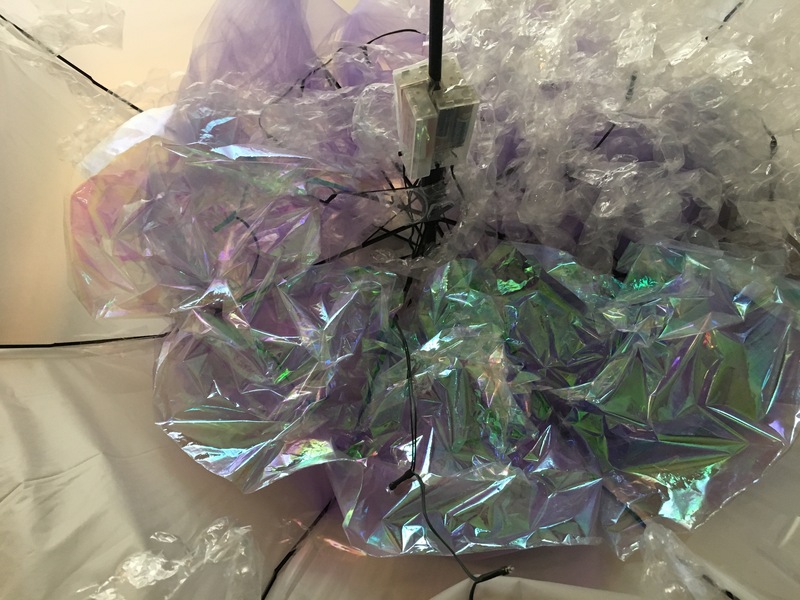 And I used a yard of purple and white tulle I already had in my stash. 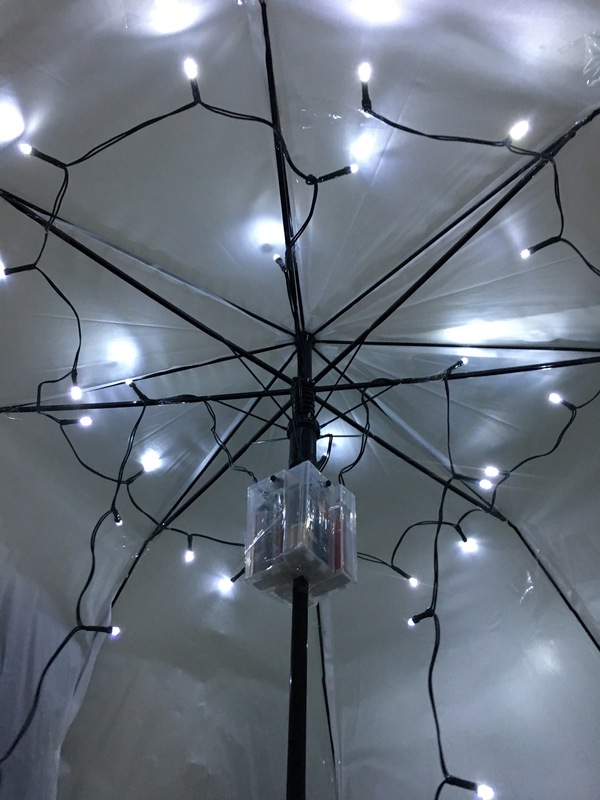 At first I bent the umbrella spokes downward to give it more of a dome and I did it too much and it looks kind of wonky BUT this caused the material in between to flap in the wind give it more of an organic, jellyfish feel. I taped the lights around the inside. 2 strands taped around the top inside and 2 strands hanging down near the pole. I taped the battery packs high up and around the pole for easy on/off switching. 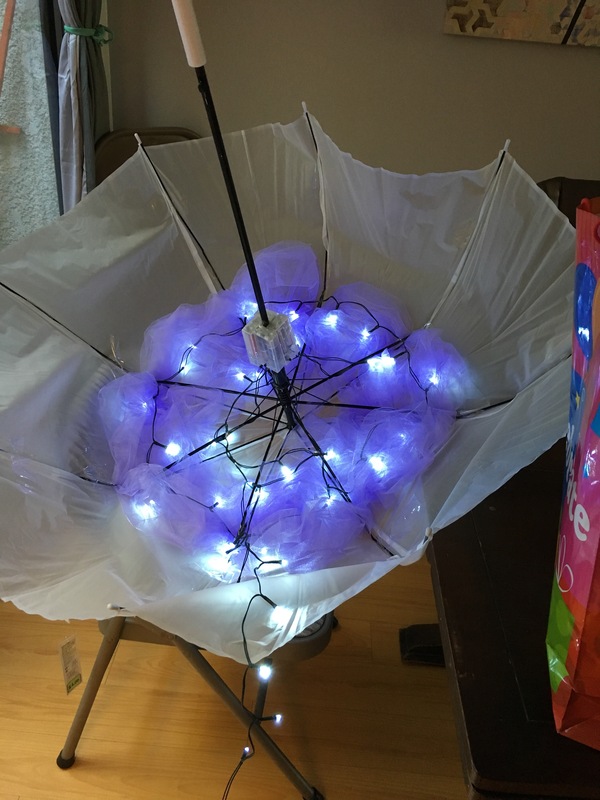 Next I took purple tulle and just weaved it between the umbrella material and the spokes. I cut jumbo bubble wrap (new or recycled) into 3 foot strips with the bubbles down the middle (about an inch) this will cut into every other bubble. I taped them at the point of every spoke and half way up. So about 16 strips total. Then I taped the iridescent celephane over the lights. I cut the roll in half (long ways) giving me 3 feet by 20″ strips. Taped good at every spoke to make sure it doesn’t fall down. I use packaging tape on everything because it’s super sticky and very clear. Next I basted 6″ strips of white tulle (1 yard long) and pulled the thread on both sides creating a ruffle. These are tied to the top near the pole. 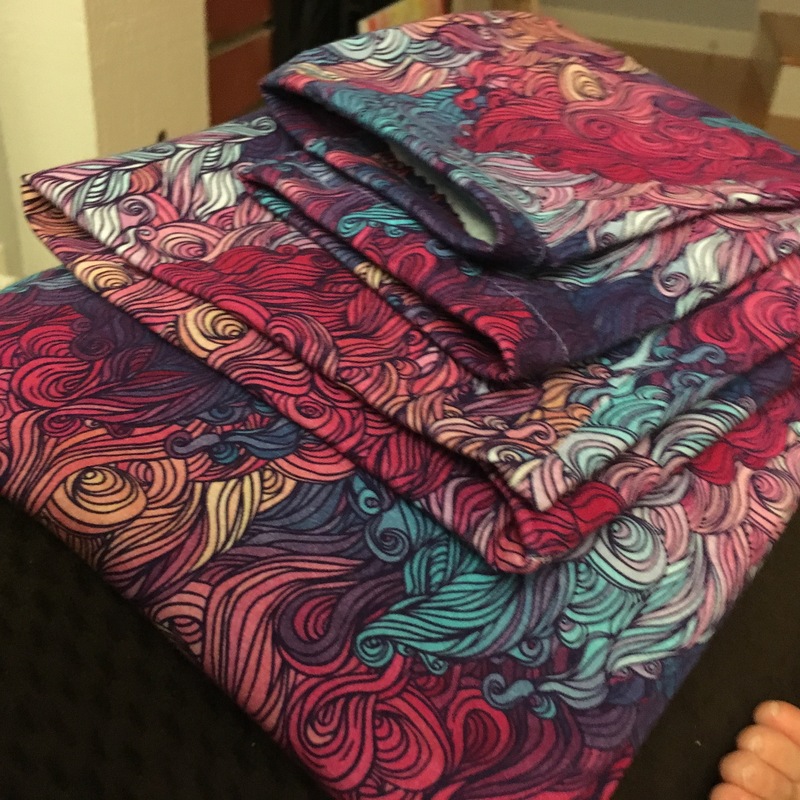 I’ve made 2 finished pieces: 2 yards each. I plan to make 2 more strands. Here’s a picture of the inside lit up. 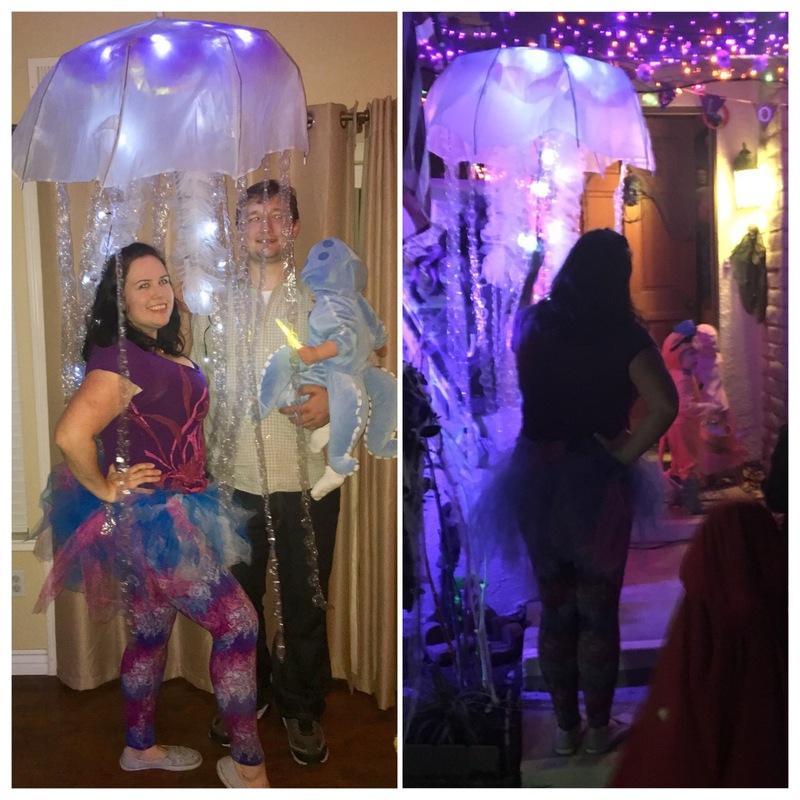 I am using some amazing cotton lycra fabric from Pink Zepellin Fabrics called “Smoke on the Water” – I think they are perfect for this jellyfish costume! 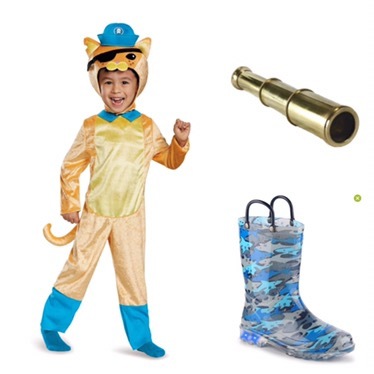 Update to follow very soon if the final final costume! 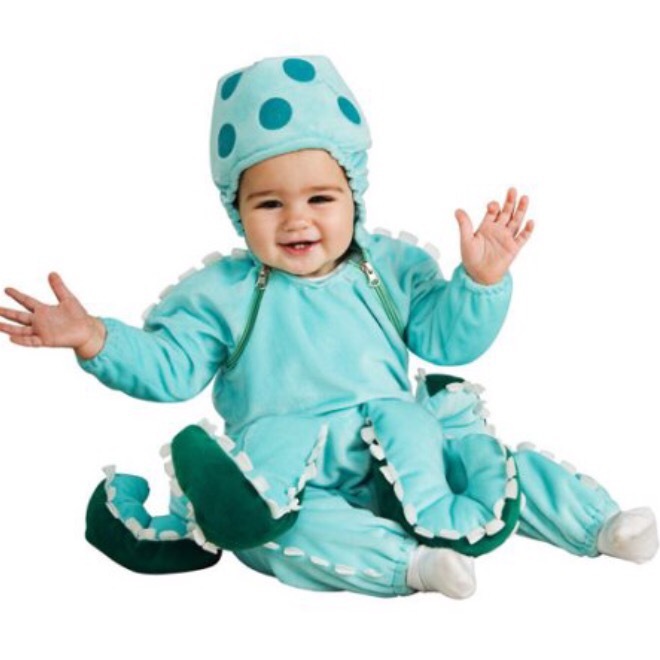 Posted in Crafts, HalloweenTagged costume, creative, diy, easy, Fabric, free pattern, fun, Halloween, jellyfish, lights, popular, recycle, sew, sewing, tutorialBookmark the permalink. 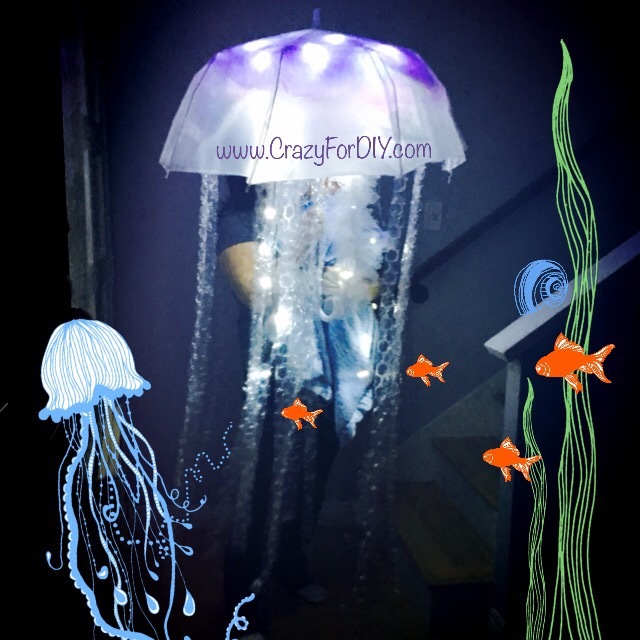 Pingback: Trunk or Treat Shark Jellyfish DIY Tutorial – Crazy for D.I.Y.